Welcome to a brand new year of doing things! It’s going to be exciting! And yes, there may be bumps in the road as we adjust to this new style but remember the reason for these changes- true conversion! It’s going to be worth it. This post provides helps for “We Are Responsible for Our Own Learning” (Dec 31- Jan 6) for Primary. Study Suggestions- Use these throughout the week to help you prepare to teach and learn as a teacher. Activity Pages- Center your lesson around one or send one home. These are great resources to study throughout the week as you prepare to teach. These are great to listen as you prepare to teach. Remember, as a Deseret Bookshelf PLUS member, you can access these eBooks or audio books anytime. Find out more about Deseret Bookshelf PLUS. We Believe in Christ: Personal Testimony (about 3 minutes)- Youth share their testimonies of the Savior. You really don’t need a ton of ideas and materials anymore since your lessons will only be 20 minutes and the majority should actually be the children talking. It’ll take some getting used to and some trial and error as you figure things out. Here are a few handouts and ideas based off the ideas in the manual to help you facilitate discussion and teach specific points. Give your class a preview of some of the stories they will be learning this year with my New Testament cards game. You can use it like Headbanz or try Grab Bag. If you have an older class, try using my scripture squares. They help your class take a few verses at time and really try to understand what is in them. These nine scripture squares focus on the scriptures found throughout each part of the lesson. Pick a few to go over together and challenge them to finish it at home if you don’t have enough time to get to them all. Play Simon Says but use the words “Come, follow me” instead. If you include the whole phrase they follow your action. If you leave out “come” they don’t follow your action. Then discuss Luke 18:22 as stated in the manual. Ask the parents of your class to email you photos of the children in your class lighting the world. Print them out and use them to show how each one of them have already been following Christ and encourage them to continue to do so. 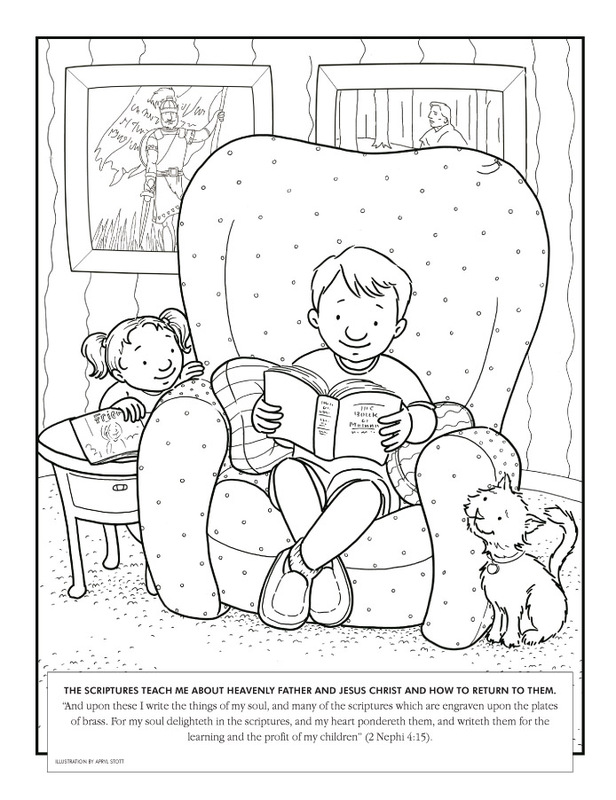 Use my coloring sheet to encourage your class to draw and share a scripture story they remember. Ask them why they like it, how they learned it, and suggest a way that it ties into our lives now. Hide my little image of Christ and other characters inside a a set(s) of scriptures (check some out of the library so you can do multiple copies at once). See who can find Christ in the scriptures. You can use the other images to throw them off the scent a little as the pages may more easily turn towards the ones with papers in them. Print on thin paper for more of challenge. Play my Scripture Friend game! It’s a lot of fun to try to guess each other’s friend and show how we can become friends with those in the scriptures. If you don’t want to sing, use this video instead then discuss as stated in the manual. Make a treasure chest for your class to put the scriptures they find each week. Staple the top treasure chests together leaving an opening at the top or simply glue the cut outs on an manila envelope. You can send your class home with a treasure page so they can write the reference or entire verse on a coin or jewel at home to add to your treasure box next week. Use my general treasure hunt clue cards to quickly put together your treasure hunt as mentioned in the manual. Make it even neater by turning your clue cards into scratch off ones. Artmind has a good tutorial. Use my daily reading chart to encourage your class to study their scriptures daily (new chart monthly). You can also use the tracking sheet with the weekly readings instead. Encourage your class to come prepared to class by reading the assignments each week and coming ready to discuss. My Bible Bingo can be a great motivator. If you have a younger class, try my free oil lamp activity. Each drop of oil has a picture on it they can color and glue on. Make a pocket lamp. Staple the two sides of the lamp together leaving an opening at the top. Have your class write on the drops of oil things they already know are true and put them inside their lamps. If they have oil drops leftover, encourage them to keep them and add them to their lamps as they continue to learn and come to know more things for themselves. Honestly, with the way these lessons are, I don’t see much use for these inside your classroom anymore. There may be a way to incorporate a Mormonad or one activity but, remember, you only have 20 minutes! See if the parents would like an activity sent home or if it’s better to leave these out of your lessons completely. Many of these resources are from LDS.org, however, some may be from other helpful bloggers. New Testament Scripture Challenge- A weekly reading chart. Instead of using their schedule, use the one in the Come, Follow Me manual. The Scriptures- Use these flowers and glue pictures of scripture stories to them. Glue the flowers on paper or attach pipe cleaners and make a bouquet. Search the Scriptures- A fun find the hidden objects pictures but can use as a coloring page too. Go over the fundamentals of a testimony and use a few more ideas in this Sharing Time post. A Growing Testimony- Color flowers and discover ways to build your testimony. How Can I Gain a Testimony?- Color pictures of activities that will build testimony. Sharing Time: I Have a Testimony of Jesus Christ- Cut out stones of a testimony to build a fortress. Testimony Glove- Make a glove to show your class the elements of a testimony. Testimony Toolbox- Cut out the "tools of testimony" to place in the toolbox. How Can I Get a Testimony?- Illustrated pictures of things we can do to build testimony.